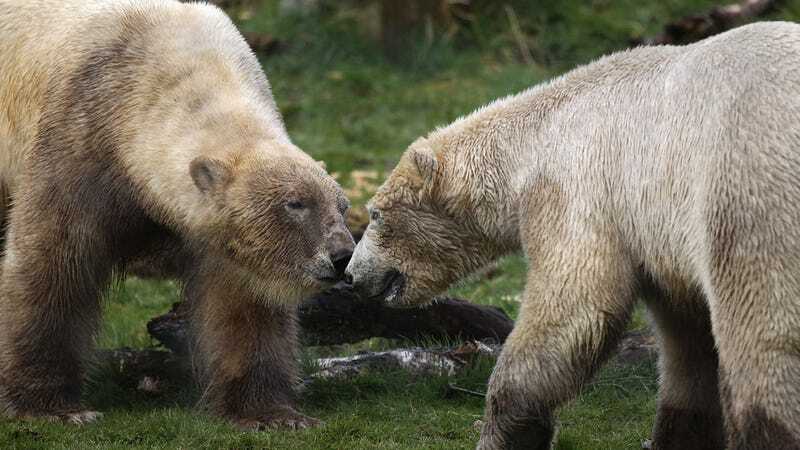 Since being introduced last month at the Highland Wildlife Park in Scotland, polar bears Arktos, age 4, and Walker, age 3, have become nearly inseparable, even sleeping nose to nose or paw to paw. That sound you hear is the collective coo of readers everywhere. "We had really only started to introduce them for longer periods of time during the day when we spotted Arktos was missing Walker at night, whining and trying to get into the main enclosure to be with him...Quickly becoming inseparable, they love nothing more than having a good wrestle, giving chase and also stealing each other's meat at feeding time...I don't think any of us knew that they would get on quite so well in such a short space of time — it is safe to say that they are definitely in the early stages of a budding bear 'bromance'." Image via Jeff J Mitchell/Getty.